At some point, anyone who is lucky enough to have a dog will be facing a very special time: the beloved four-legged friend’s old age. This book aims to provide ideas on how to make the dog’s later years particularly enjoyable and give them [him* *These are the copy editor’s changes: no doubt dogs everywhere would have been offended by the male personal pronoun!] everything they need [he needs] for this phase of their [his] life. Readers will learn about the needs of older dogs, all the changes that can occur as their dog ages, and how to ensure that the senior dog stays fit and healthy for as long as possible. Valuable tips on feeding the elderly dog, dealing with behaviours that are typical in old age and communicating with canine seniors that can no longer see or hear so well are included. 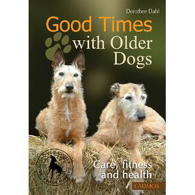 A comprehensive guidebook for owners and carers of old dogs for wonderful golden years. Dorothee Dahl lives with her husband and her dogs, Shetland ponies and sheep in the Lower Rhine region of Germany. Her experience with her own old dogs inspired her to deal intensively with the topic and thus convince fellow dog-owners that the time spent with senior dogs is something very special. Signs of old age can turn into problems, complaints and, ultimately, illnesses as well. Sometimes old dogs can show signs of problems that began when they seemed healthy and lively. Untreated ear problems, for example, can lead to damage in the ear which may not become noticeable to its full extent until the dog reaches old age. If the ears are not cleaned regularly, this can lead to blockages and sticky ear wax; this results not only in a pronounced drop in hearing, but the dog’s sense of balance is also impaired. Many a case of unsteady walking or even swaying in dogs can be attributed to ear problems. Foul-smelling ears with discharge are always alarm signals and require a visit to the vet. There may be an infection present that requires treatment with antibiotics. With the eyes, sometimes not only does the vision decline, but other eye complaints which never bothered the younger dog also arise. There are elderly dogs that get so-called ‘dry eyes’: the resulting bacterial infection (keratoconjunctivitis) is favoured by the fact that older dogs produce less tear fluid, or the composition of the tear film has altered to such an extent that it no longer provides sufficient protection to the eye. This infection is treated by the vet using an eye ointment. In addition to ear and eye complaints, restricted mobility frequently causes old dogs a lot of discomfort. As with humans, bone condition deteriorates and tissue elasticity declines in dogs with age. We can take preventive measures against the complaints of old age by means of targeted feeding, but we cannot avoid them altogether. Although the supply of nutrients, such as calcium for example, strengthens the bones, it cannot halt symptoms of wear. For example, the cartilage lining of the joints wears down, potentially leading to arthrosis or arthritis. An accompanying breakdown of the musculature can lead to geriatric complaints that strongly restrict the dog’s mobility. This is no reason, nevertheless, to sit back idly. If you adapt the dog’s surroundings to their [his] altered living requirements and provide them [him] with the appropriate treatment, they [he] will be able to live a wonderful life even with geriatric complaints and continue to bring you a lot of pleasure.